Very few historical figures are as controversial as Martin Luther. His supporters call him a Protestant hero, a freedom fighter, a wise and insightful church leader. His detractors call him a heretic, an apostate, a profane ecclesiastical terrorist. Still others call him a necessary evil or the unwitting catalyst that set aflame a volatile social and ecclesiastical situation. 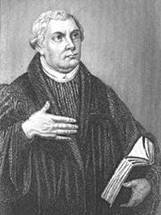 Luther, himself, often called himself a simple monk or a simple Christian. He marveled that a straight-forward stand of conscience had turned him into one of the most-talked-about people of his time. Yet that simple Christian and that simple stand of conscience started an ecclesiastical shock wave that changed the course of Western history. Note: The Luther Timeline is undergoing a much-needed renovation. As I get time, I’ll check the links and clean up some of the formatting. In the meantime, I’ll be keeping the site up. Please pardon our dust.